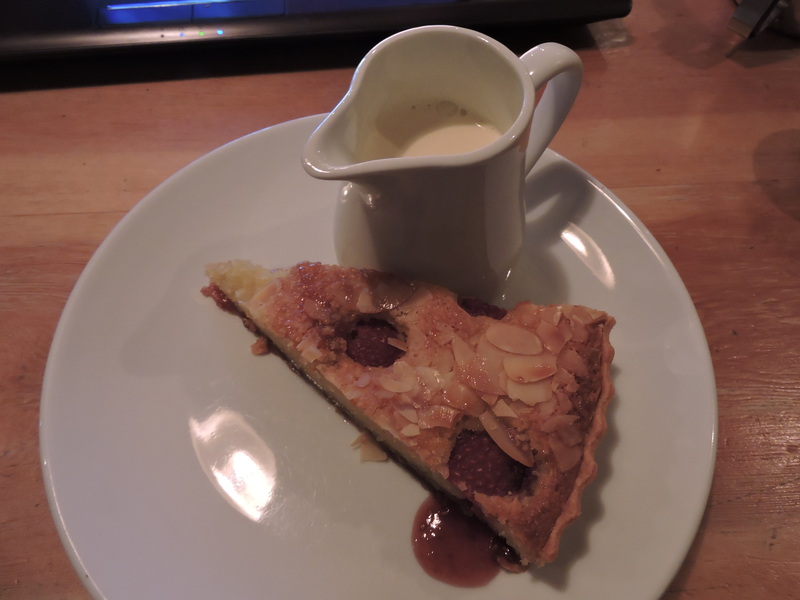 The Bakewell tart is warm and delicious with a homemade jam still clinging to the sweet taste of summer strawberries, a crisp, crumbly pastry that Mary Berry would be proud of (as indeed she was – the founder of the pudding shop, Johnny Shepherd was a contender on the 2010 Great British Bake off) and a firm yet light frangipane given texture by the addition of flaked almonds and pips from the whole strawberries embedded in it. So pleasurable you don’t want to swallow it, and instead deem to hold it in your mouth as long as possible whilst it slowly disintegrates. The leftover cream makes a cheeky addition to your cup of loose-leaf breakfast tea, sweetened with brown sugar from the table. The tea comes in a bottomless pot, with young friendly waitresses bringing you hot water top-ups and refreshing your leaves as needed, no extra cost incurred. This, combined with its cosy atmosphere (all large scrubbed wooden tables and trestle benches, tea-lights in jam-jars and Mumford and Son’s first album playing in the background), makes it a perfect place just to sit down and write. Or read. Or even bring in your colouring pencils. Indeed at the moment, sitting typing this review with my laptop plugged in and the comforting warmth of the cafe shielding me from the chill October night outside, it is sleepy bliss. Though you might have to put up with a few small children giggling and wandering around in the background (the Pudding Stop is a popular treat for families and mums meeting up) it is certainly worth it, and has swift become my favourite place to while away a few hours on a Sunday afternoon any time that I need something done. Besides, who can say no to this much excellent pudding? 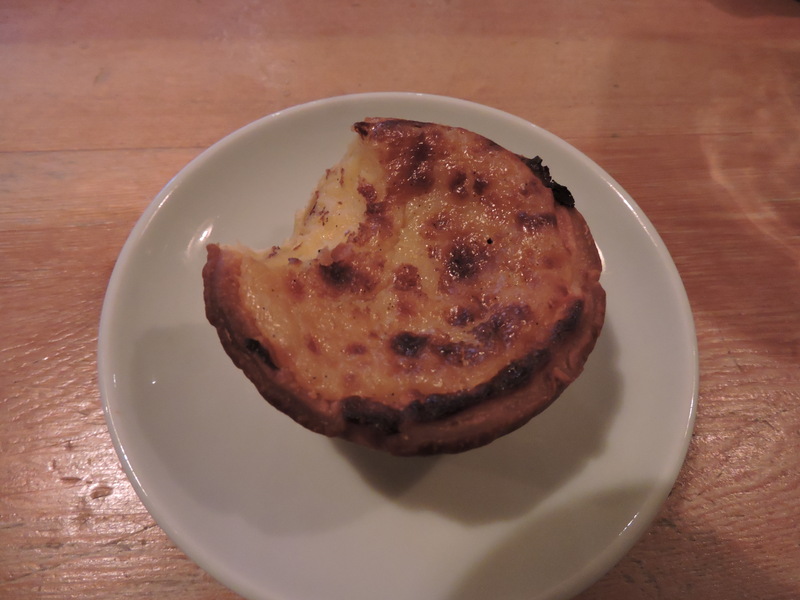 It is not cheap, though you can also take-away if you wish (one box, one pud, £3), but neither is it extortionate; rather you pay for what you get, and the quality is far better that you would get in many local restaurants for the same price. Their specials change daily, though always include a crumble, a steamed sponge and a ‘special special,’ which today is a peanut butter and salted caramel brownie with salted caramel chocolate sauce and ice cream. I have eaten it before; it is an indulgent explosion of gooey caramel and dense chocolate, so rich that even I couldn’t finish it. 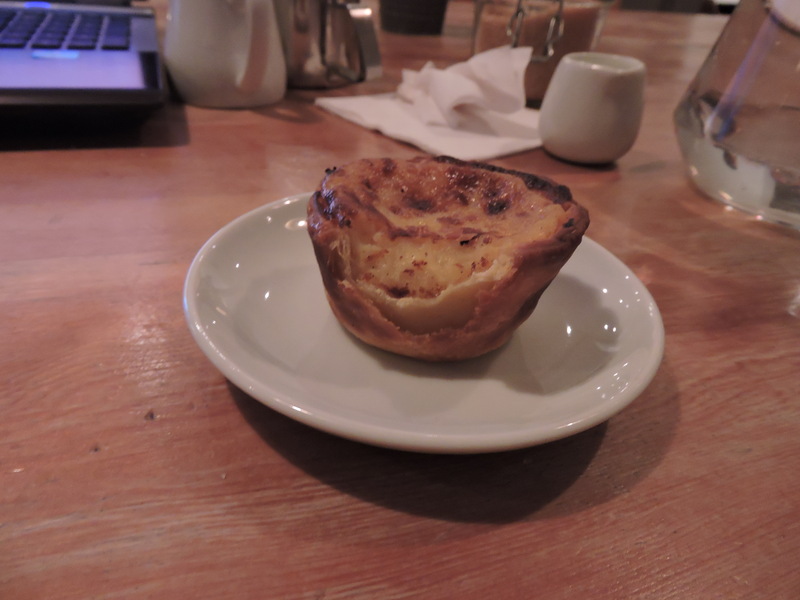 Today though I am happy with my slice of Bakewell from the counter, where a further selection of delights awaits; treacle tart and pecan pie, apple crumble doughnuts and Pastel de Nata (tiny Portuguese custard tarts – and truly the best I have ever eaten). The Pudding stop has come a long way since it was merely a van outside the station, flogging puddings to passing commuters, although the Pudmobile is still in operation and acts as a veritable temple of temptation every time I pass it on the way home from work. 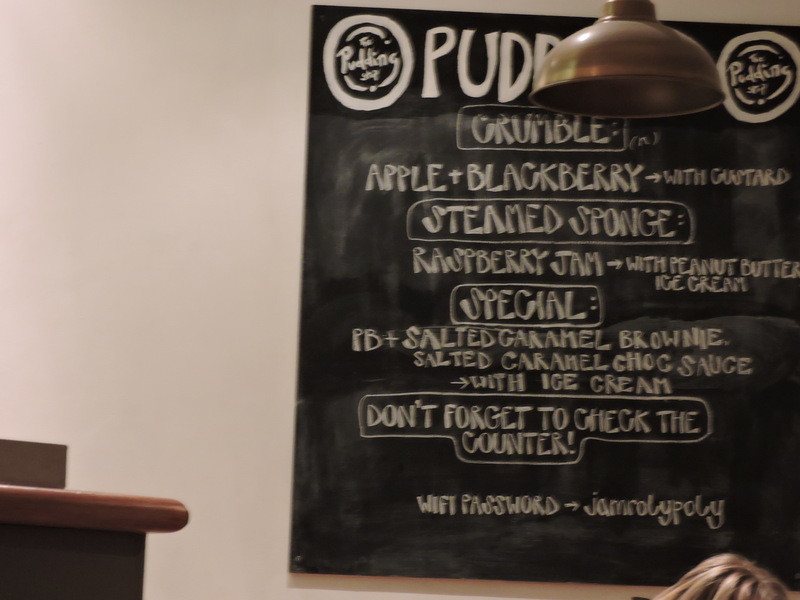 The restaurant/café opened its doors in 2013, and all of the puddings are now baked its top floor. 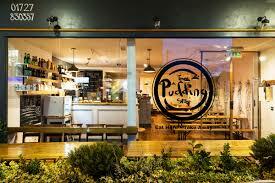 As the merchandising says, there are many places to eat a main course in St Albans, but there’s only one Pudding Stop. I have to agree.